Also known as the Chang Building, Bangkok's cubist Elephant Tower is 335 feet high and 560 feet long. It's a national landmark that references the elephants and symbols of elephants that have been an intregal part of Thai culture, industry and religion for centuries. For much of the 116 years of its existence, the Atlantic City area's Lucy the Elephant bulding was the world's largest elephant-shaped structure. That changed in 1997 with the opening of the Elephant Tower in Bangkok Thailand, which according to Bangkok Post and Architectural Digest, has since become "the most talked about building in Thailand" and a national icon as well as the world's largest elephant building. Opened in 1997, Bangkok's Elephant Tower was the brainchild of engineering and real estate mogul, Arun Chaiseri. offices and luxury condominiums on 32 floors. Some 560 feet long and 130 feet wide, its ears are actually multi-storied balconies, its eyes are huge windows, its tail is comprised of 20 stories of smoked-glass enclosed rooms jutting from its rear, and its tusks house the offices of the bulding's management company. The tower was one of a slew of uniquely shaped or sized buildings sprouting across Asia from Shanghai to Mumbai in the 90s, each symbolizing a new level of corporate prowess or national pride. For instance, along with the elephant, Bangkok also saw the rise of a skyscraper shaped like a robot and another shaped like a pair of gargantuan diamonds. 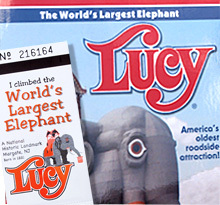 While it's ultra-modern lines are a far cry from the traditonal realism of Lucy the Elephant's wood-frame and tin-sheathed profile, the Elephant Tower clearly qualifies -- and is internationally recognized -- as an "elephant building," thus making Lucy the world's second largest elephant building. 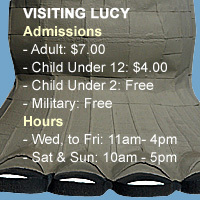 Lucy the Elephant's managers continue to use the 'world's largest' claim on their promotional materials. The consensus on this point is so strong that the editors of Wikipedia forced the "world's largest" claim to be removed from Wikipedia's Lucy page. This has created something of an awkward situation for Lucy's current managers who continue to aggressively promote the Margate tourist attraction as "The World's Largest Elephant" building, even thought it isn't anymore. But, perhaps that's wonderfully true to the spirit Lucy's creator, James Lafferty, who applied similar carnival barker hyperbole to his own 1880's seashore real estate sales scheme. Not surprising, the creator of Bangkok's Elephant Tower -- Thai Senator, engineer and real estate mogul Arun Chaiseri -- was as much a character as Lafferty. Chaiseri studied engineering (and met his wife-to-be in 1960) at the University of Illinois in the U.S. and went on to build one of Thailand's largest engineering firms --Arun Chaiseri Consulting Engineers Company Ltd. He also was an advocate for the welfare of Thailand's large stock of real elephants and maintained his own museum exhibiting more than 2,000 elephant-shaped art objects, including thousand-year-old porcelains.